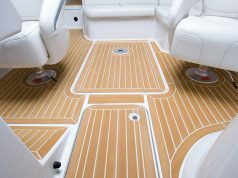 Onboard water makers can extend your cruising comfort. When your cruising plans call for long days at sea and anchorages far from civilized services, the conservation of ship’s stores is top of mind. Managing food and fuel is crucial—when they run out, your body and boat shut down. Potable water is also a concern. When the freshwater holding tank is empty, the vast, salty ocean cannot slake your thirst—water, water everywhere, nor any drop to drink. Onboard watermakers have made the ocean your reservoir as reverse-osmosis systems turn raw seawater into drinkable freshwater. 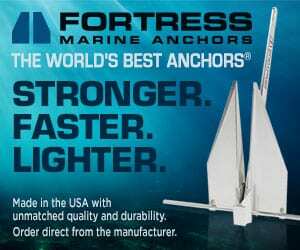 Processes have improved, equipment has become smaller and prices have dropped since these devices entered the marine market in the late 1980s. Whether or not you need a watermaker depends on your boating activities. If you enjoy coastal U.S. cruising and rarely stray from ports where freshwater is available, then the need for a watermaker is small. 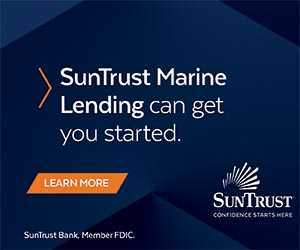 But if you have a sportfishing boat and are out for days at a time or cruising to foreign ports, then a watermaker is a necessity. At 8.35 pounds per gallon, water is heavy. A sportfishing boat embarking on a 50-mile run can save a lot of fuel by starting with minimal water in the holding tanks. Once you start trolling, the generator is turned on and the watermaker starts making freshwater while you fish. Watermakers use a series of pumps, filters and membranes to turn raw seawater into freshwater. The current Environmental Protection Agency (EPA) standard for potable freshwater is less than 500 parts per million, and all the manufacturers’ products in this article meet that standard. The process is reverse osmosis, the same technique used on a large scale at desalination plants. At the heart of the process is the membrane, a filter with pores the size of a red blood cell. After the larger particles in seawater are filtered out, the high-pressure pump forces water through the membrane, which removes almost all of the dissolved solids. This method rejects up to 99 percent of salts, contaminants and pollutants from seawater until the water purity meets the EPA standard. Biological growth when a watermaker is not in use can affect water quality. Heat and standing seawater is the ideal environment for biological growth, and that’s always been the bugaboo for watermakers. In the past, keeping biologicals from growing involved flushing the system with acidic chemicals, but today, freshwater flushing keeps the membranes clean and greatly reduces maintenance. Most boats 40 feet and longer will use watermakers run with AC-powered pumps; however, DC-powered watermakers are available for smaller powerboats and sailboats. AC-powered systems deliver a more constant flow rate and higher pressure over a longer period of time, while DC systems are for boats with less demand and smaller water tanks. 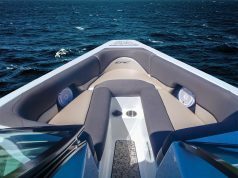 Here’s a look at watermakers recommended for cruising boats 40 to 60 feet long from four U.S. manufacturers, including well-established companies FCI Watermakers, Sea Recovery and Watermakers Inc., as well as up-and-coming Sea Xchange. Watermakers Inc.’s ISL400 operates conveniently from under the sink. The Aquamiser Plus and Max-Q lines are ideal for boats requiring 25 gallons per hour (600 gallons per day [GPD]) or more of freshwater production. Both are available in framed and modular configurations and include automatic freshwater flush. The Aquamiser Plus series offers outputs of 250 to 1,800 GPD, programmable settings and remote display capability. 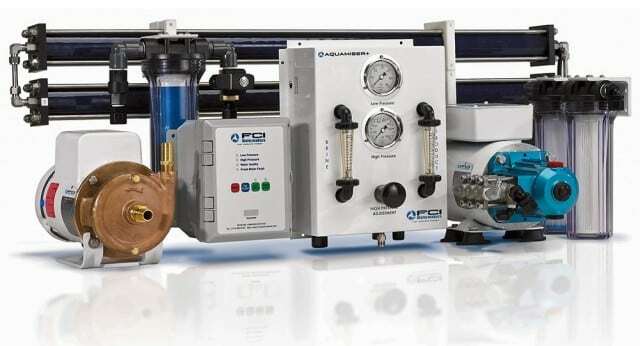 The Max-Q Series is more advanced and offers Universal Reverse Osmosis Controller (UROC) remote monitoring and control from a personal computer, with outputs of 600, 1,200 or 1,800 GPD. 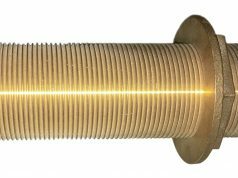 The Max-Q’s digital design is engineered for durability, and the need for pressure gauges and flow meters has been eliminated. FCI’s freshwater dockside system can also be incorporated into the Max-Q, and this helps create ultra-freshwater for a spot-free rinse. The new Aqua Whisper Mini modular fits in tight spaces for easy access to main components. Water production ranges from 170 to 750 GPD. 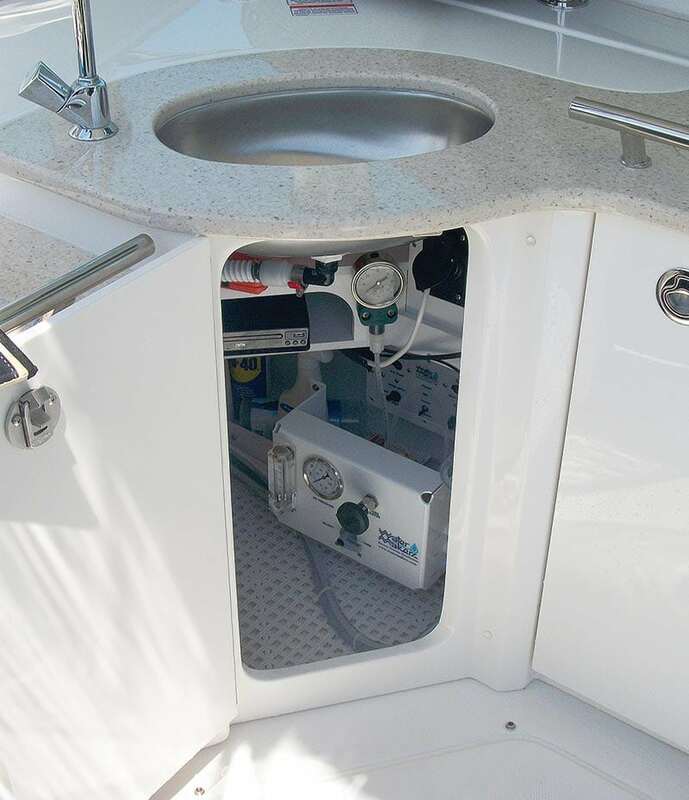 Low AC power consumption and its light weight (units range from 70 to 150 pounds depending on the model) makes it suitable for smaller boats. Simple touch operation on the unit, as well as from a remote location, makes it easy to use. The touch pad provides 16 illuminated LED status lamps that indicate system operation and water quality. Fault LED indication is also provided for easy diagnosis of required maintenance. The ISL 400 offers reliability and simplicity in a “no-frills” desalination system, with an output of 432 GPD. Featuring a compact and rugged design, the ISL 400 is available pre-mounted on an L-frame or as a modular unit if space is limited and innovative installation is required. The product’s design uses no propriety components allowing the owner to find replacement filters, oil or parts nearly anywhere in the world. An available option is automatic flush of the watermaker every seven days. The SX600 features an all-in-one compact design for conversion from a framed to a modular system in a few easy steps in outputs from 600 to 2,200 GPD. Non-proprietary components such as a 316 stainless-steel boost pump, high-pressure pump, automatic freshwater flush, and a remote control come as standard features. A one-touch interface makes operation simple, and the system can be coupled with Dometic’s Spot Zero freshwater system to provide true double-pass reverse osmosis freshwater.